Have you ever wondered what proportion of your life you spend circling carparks looking for that elusive spot? Is driving or catching a bus to Mac Park faster? Read on for these and other thought-provoking transport facts. The average person spends 15 minutes a day looking for parking, that's 91 hours a year or 152 days in a lifetime! According to Car Advice this equates to $1.3bn in petrol spent by Australians looking for car parking.... its enough to make you reconsider driving to the shopping centre. Driving alone from the Lower North Shore takes on average 30mins to Mac Park, whilst travelling by bus takes 35 - thats an extra 5 minutes of listening to your podcast and watching the world go by! You think $28 a day is expensive in Mac Park The Sydney CBD ranks in the Top 10 most expensive places to park on the planet (Tokyo, London and New York didn’t make the list). On average it costs $89 to park for 3 hours whereas the average parking fine is $86 – maybe time to consider taking the bus. 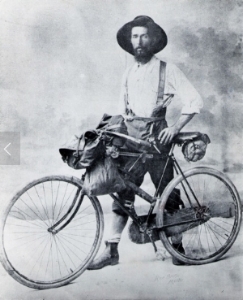 The first bike couriers in the WA gold fields used to ride 80 to 100 miles (or 160kms) a day! - no wonder this fella looks so fit.